Update: If you like this place or decide you want to try it out with some friends, Groupon is offering $20 worth of pizza for $10. I love pizza. Plain and simple. But in a city known for its pizza, there are a lot of bad slices out there. And much of it has gotten increasingly expensive (though at the same time, there's been also been an outbreak of 99 cent pizza places). So, when it's free, it's not a gift to be overlooked. 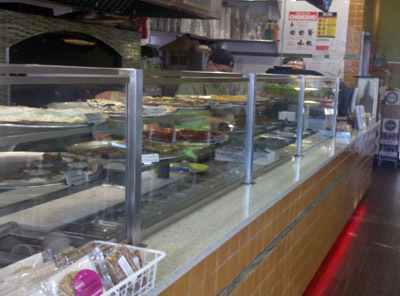 When I saw a coupon on Tenka for a free slice from Rev'd Up Pi in Murray Hill, I jumped on it. I had heard about this place, which claimed to offer healthy pizza, just 170 calories per slice. I was dubious and with prices starting at $3.50, I wasn't likely to try it on my own, not when my favorite spot is nearby. So I walked in to the pizzeria and found the people behind the counter not immediately attentive, but I couldn't complain too much when I'd be mooching off them. I was allowed to select any kind of pizza I wanted. 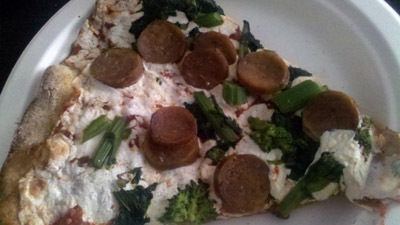 So I chose the broccoli rabe and sausage slice — I thought the added toppings would make it more filling. I was pleasantly surprised. The slice was an average size, not too small, and fairly tasty. The whole grain crust, which was extremely thin, lacked salt but otherwise, I liked the minimal amount of sauce and the toppings were good. But when I'm in the mood for pizza, I'm not necessarily thinking healthy. I wouldn't go out of my way for Rev'd Up, but if I were in the neighborhood or in search of a late-night snack (it's open until midnight on weekdays and 5 a.m. on weekends), I just might consider it. Always thinking about my next meal.